My first mousse was under the direction of my mother in law, her classic Mousse de Maracuya, is an incredible luxury, drizzle with a Pisco Creme Anglais and a coulis de maracuya (Maracuya=Passon Fruit). The great thing of having learn hers as my first, is that I have really learned the classic french technique, she used egg whites to make hers as well as the use of gelatin and the correct way to fold ingredients. There are so many ways to do a great mousse, some people goes traditional and uses the classic technique of the stiffed pick egg whites, some other recipes call for chocolate to replace the curd or patisserie based and it also aids to setting the mousse, other ones are made from a fruit pure or curd and set with gelatin, the addition of a low in sugar creme Chantilly and/or whipped egg whites. At the end there is one great description for mousse. When making a mousse for the first time, considered the description of the end project. A cold dessert with with an airy sensation with every bite; is light on texture and always before setting looks somehow airy like whipped egg whites with a little bit more of body. When just made you can shape it, and it will set in that way. Great for filling a Gateau, fritters, or to shape into a cake on its own. 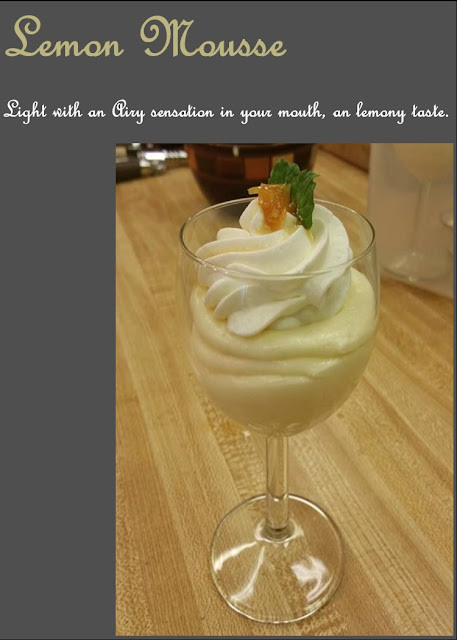 The recipe bellow is one that uses gelatin, creme Chantilly, and a lemon curd. Enjoy!! 2 Tblsp Sugar, use honey for a more Greek or Mediterranean taste. In a large dip container, place the cool water and proceed to bloom the gelatin, sprinkling the gelatin powder evenly back and forward if necessary. It will set and soft harden into a jello looking block. Reserve until ready to use. In a metal bowl, large enough to sit over a boiling pot of water without touching the water, combine all of the first ingredients. When the water starts to boil, place the bowl with the ingredients and constantly stir until the curd is thick and pale, the liquid should get to about 175*F, or you can use the ribbon technique (swirl your whisk and when it drizzles down it should take about 3 seconds to completely dissolve into the curd). When your curd is ready, move away from the heat, but continuous to stir, incorporate the gelatin. The heat in the curd will melt the gelatin. Quickly after that sieve the mixture into another bowl, and cool until ready to use. It needs to be completely chill before using. Cover with plastic wrap, allow the plastic to touch the mousse too prevent a crust to form. Chill your heavy cream, for about 10 to 15 minutes, Make the Creme Chantilly. Whipped the Cream, when starts to look a bit thicker but still thin, incorporate the sugar (like raining over the bowl and always mixing at the same time), then just keep mixing until the cream come to stiff peaks. When ready, add 1/3 of the curd to the bowl of the chantilly, you can quickly whip, then lower the speed and add another third. When adding the last part of the curd, fold it in. To easily shape or fill the cups, use a pastry decorator bag.